Last week, while we were in Texas, we took Little Man for a wagon ride and strolled around to look at all the Christmas Decorations in the neighborhood. We donned his vest and away we went. Here…we have the baby of the family…visiting Baby Jesus!! 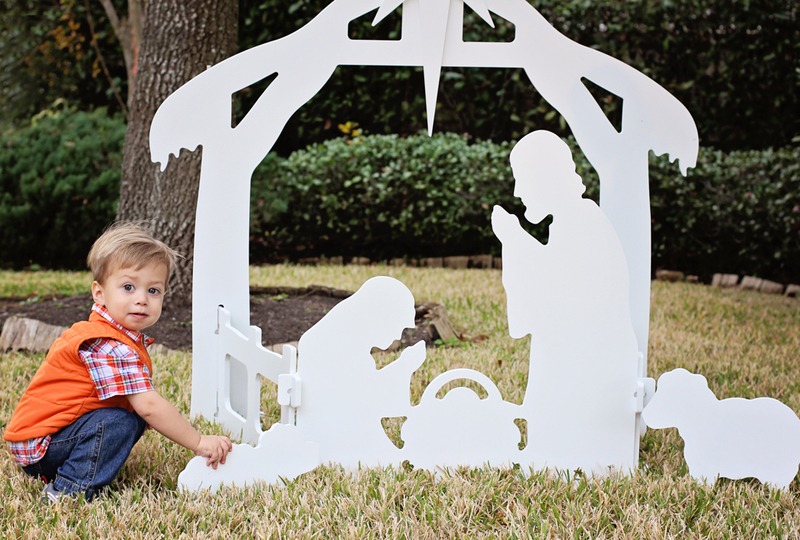 I told him how much we love Baby Jesus…he wanted to bend down and give him a kiss…sigh. How precious is that? He had so many decorations to point out to Grammie and Papa. Sometimes, he couldn’t take his eyes off of the decor as we would pull away…very PREOCCUPIED!! 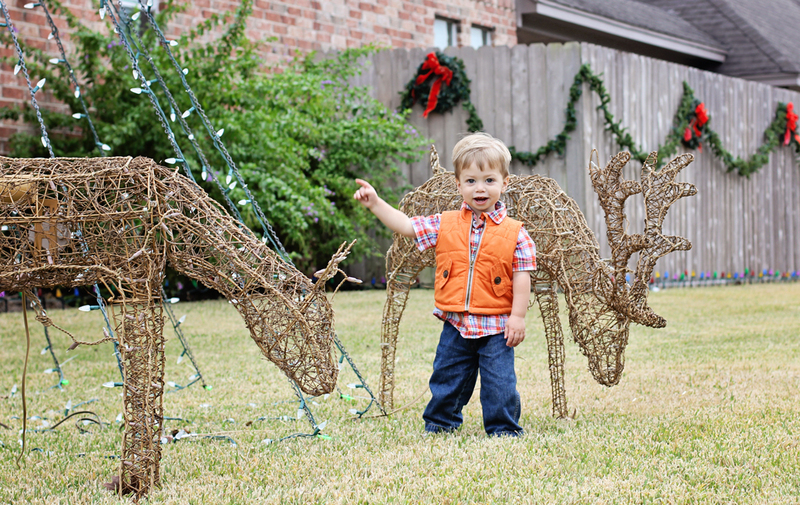 But when we got to the reindeer section oh my…his eyes lite up like sparklers. He was patting their heads, giving out kisses and then we all started singing…Rudolph the Red Nose Reindeer…Had a Very Shiny Nose. Don’t the little ones make Christmas just extra special? I wouldn’t trade all the money in the world for this moment we had with him. Hoping you don’t mind how late it is in the season for posting this. Just too cute to pass up. Bonus Inspiration: Look who I found this week, Alessio Albi…her portrait photography work is very interesting. What will be inspiring for you, is the photography she produces with such limited equipment. Click here for an interview with her. ‘Little man’ is absolutely precious! Great photography (as usual). Thanks for sharing the bonus inspiration link… what an amazing artist! Very precious indeed! He is going to be quite the charmer when he grows up with that twinkle in his eye! Laurie, that first picture is greeting card perfect! It’s never too early or too late to remember the Christ Child. Wendy, you are SOO sweet…thank you for your visits throughout the year! First off, thank you for stopping by and leaving a nice comment. I do hope to see you again. 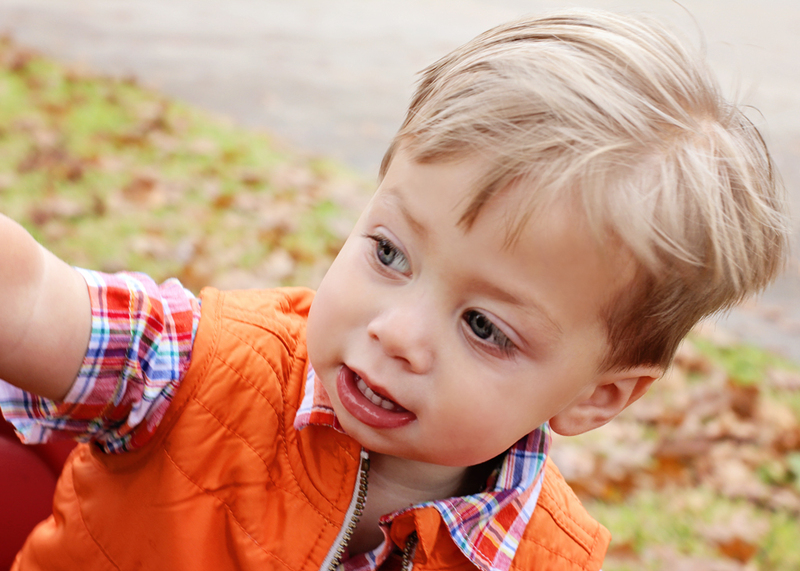 Now…your photos of the Little Man are absolutely adorable! Those eyes are going to break a lot of female hearts in the future! I love the way you captured his expressions. Happy 2014 to you and yours! The eyes on that boy are just amazing. He’s too cute for words. I never get tired of seeing photos of your little guy.. He is adorable. Gosh, I got this and read it yesterday and am just now getting here to comment. I read blogs on my iPad while I’m walking on the treadmill but I can’t comment and sometimes it takes far longer to get around to that than I intend! Anyhow … this is priceless, beyond adorable. Priceless. What a cute baby, the season really is magical when seen through the eyes of a young one! So adorable!!! 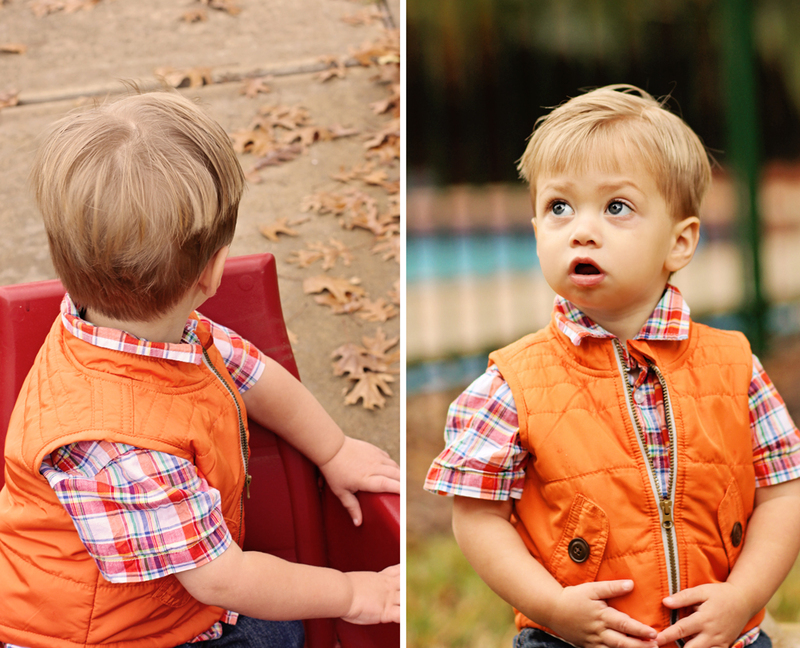 Love the orange vest! So wonderful to see Christmas through the eyes of a child. Beautiful. They do make everything extra special! How adorable and so happy face of him. Thank you for sharing your special moments with us, Laurie! Love these Awesome shots! Oh – I bet the kiss to baby Jesus was a priceless sight to see. That will live in your heart forever & always I’m sure. Judy, you have me laughing so hard….thanks so much for your comment. I told Little Mans mommy…she loved it too. Great colour rendition; I can’t imagine the lens you’re shooting with but it’s very sharp! So so precious. Jesus tends to value the childlike faith! These are adorable captures of his sweet spirit. It is wonderful to see the world through the eyes of a child.The baby of the family has such expressive eyes and mouth too.He is adorable and so awake. That is what I miss most about the holidays – the innocence and excitement of the children, so thanks for sharing. You could post more if you have them because it would help too keep the spirit of the season in our hearts and minds. Beautiful little child – surrounded by love and photographed so stunningly I felt like I could reach out and touch him! You really captured the wonder that children see in both religious and secular decorations. They belong together! We love you sharing your Little Man with us….he is so adorable. You’re a fabulous photographer, Laurie! Christmas wouldn’t be the same without the patter of little feet! There is nothing quite like having little ones around at Christmas. You can just see the awe and excitement in his eyes. These photos are super cute!